All the concrete has been poured for the grow beds and the fish tank. The crew has done an excellent job and now they will proceed to plaster a smooth finish on the concrete. We are now returning to Charlotte and will let the concrete cure for a month. Upon our return we will seal the concrete and assemble to pump lines and aeration system. Also the cover structure, storage building and solar system will be in place when we return. 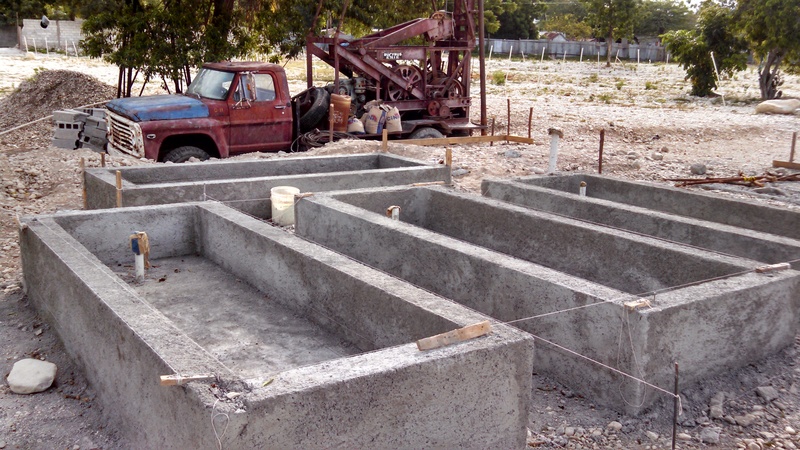 Today the crew began pouring the concrete walls for the growing beds. The plywood was the 3/4″ thick board and had to be cut by hand, just as everything has to be done in Mahanaim. There is electricity here so if battery powered tools were available they could be charged and progress would speed up dramatically. Nonetheless the crew worked all day cutting the boards to size and framing the walls. By the end of the long day two of the growing beds had been poured before we ran out of plywood. Tomorrow we will remove the plywood and use it to frame the last growing bed and fish tank. It rained here for the first time since I have been here and it was quite a relief to get some cool weather in the evening. The tin roof shattered with sound but I can deal with that given the cooler night. It looks as though I will need to return on a later date to begin operation of the system as we will have finished construction, but we will not have the correct growing medium. Things are very difficult to find in Haiti, and much more expensive. 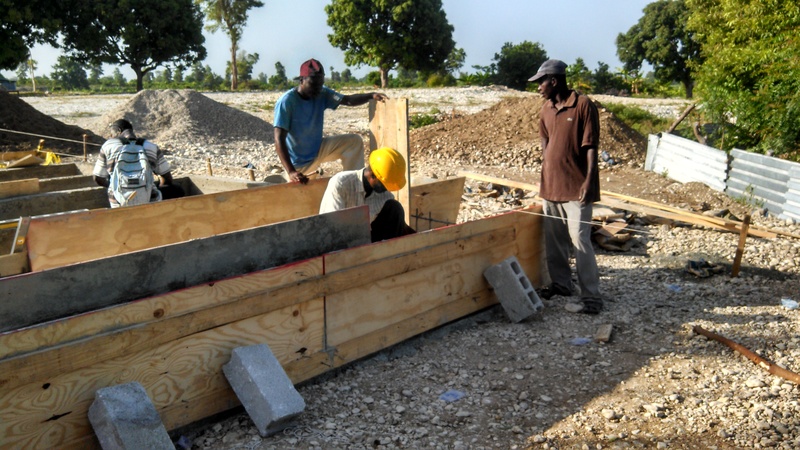 Shipping to Haiti is very inefficient and since most products are not manufactured here, the cost of everything is higher than one would expect in a developing nation. This makes life even more difficult for the poorest population in the Western Hemisphere. When I return I will try and find a way to deliver the rest of the materials we need either in the USA or hopefully in Haiti. I have seen some swimming pools here but the epoxy paint may have been imported. Finding a suitable growing medium will be very difficult as most gravel and sand here is combined with various different rock types and soil. If we come to a point where we just cannot find a source for the substrate we may just have to try and source from the Dominican Republic. We would likely not be able to bring in truckloads of medium but perhaps we could bring in styrofoam sheets for a raft system. This would be disappointing because I feel in a place with limited electricity that the flood and drain system would be more appropriate. Only time will tell. With that being said we are on the right track. Productivity was in the air today in Mahanaim. The construction crew got started at 8am and worked until 7pm with only about 30 minutes to rest and eat. I feel so out of shape when I see how these guys work. 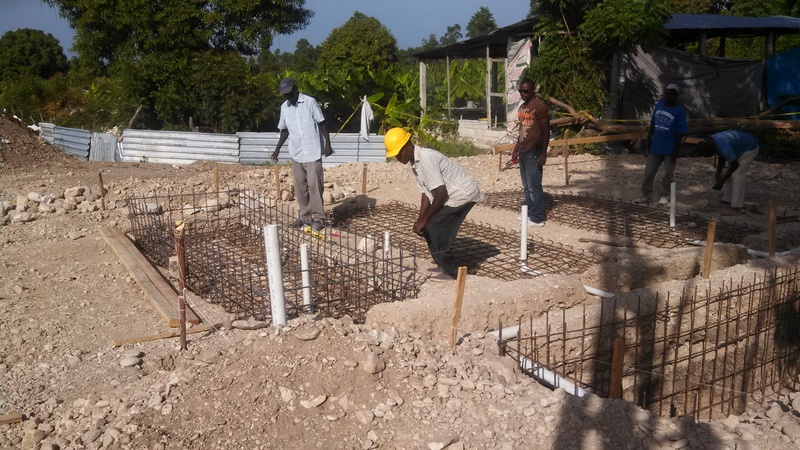 They assembled all of the rebar frames for the walls of the growing beds and poured the concrete floors for the growing beds and the fish tank. Luiguy rented a concrete mixer and by the end of the day we mixed 53 bags of cement and all of the gravel and sand to make the concrete. The workers had a procedure for getting everything mixed correctly and rapidly. Several guys gathered buckets of sand and gravel, while another group poured bag after bag of cement into the mixer, followed by the sand and gravel, and then water. 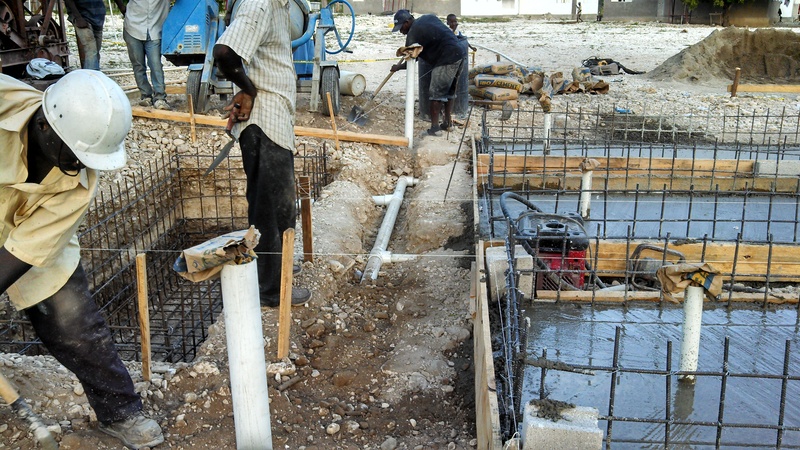 The concrete then was poured into the rebar frames and was flattened with precision, by hand. I have noticed that there is no half-assing when it comes to work in Mahanaim. The concrete was carefully spread across the frames and into every possible crevice. Then it was smoothed out by a 2×4 piece of lumber until perfectly smooth. This garden will be the strongest aquaponics system ever for its size, that I have seen at least. 1000 years from now humans will be studying it saying “these primitive humans in 2014 grew fish and plants together, and they actually had to monitor it and plant things, silly animals”. 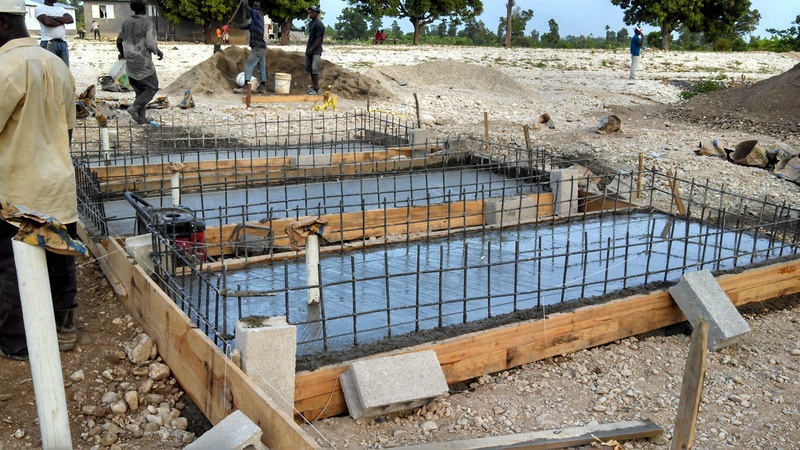 All in all it was an exhausting day given the long hours and the blazing hot weather but we should be finished pouring the concrete tomorrow! Once this is finished we will start construction of the open air building that will shade the fish tank and the storage room for the solar system batteries and supplies. By the end of the week we should be testing the pumps and have the air blower and diffuser lines installed. 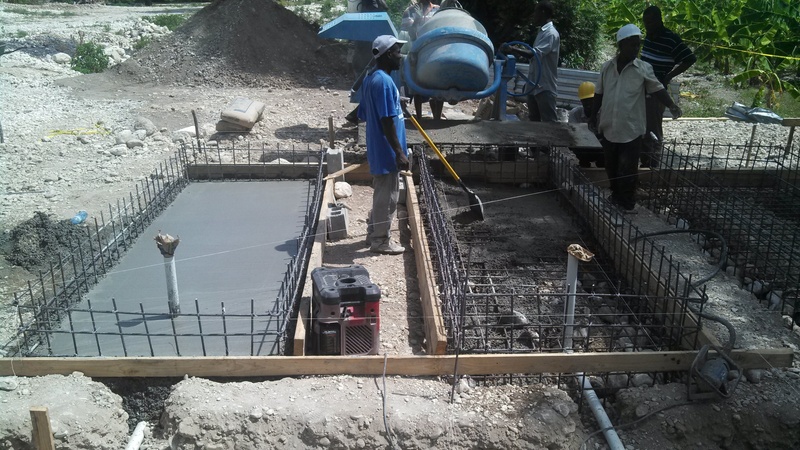 After we can test that the water is flowing correctly we will take pictures, empty the tanks so the concrete can cure, and head back to the USA. We will then try to find a solution for sealing or treating the concrete to neutralize the alkalinity. This will either be a scrubbing of the surfaces with phosphoric acid, or an application of epoxy paint. At the same time we are figuring this out we will be finding a source for suitable gravel or course sand for the growing substrate and I will be training the lead agronomist via email. He will be responsible for operating the system after we are gone. Now I am set to drink a warm Haitian beer and get a great nights sleep after a hard days work. Y’all come back now…ya hear?! Volunteers still working after 11 hours to finish the fish tank floor. 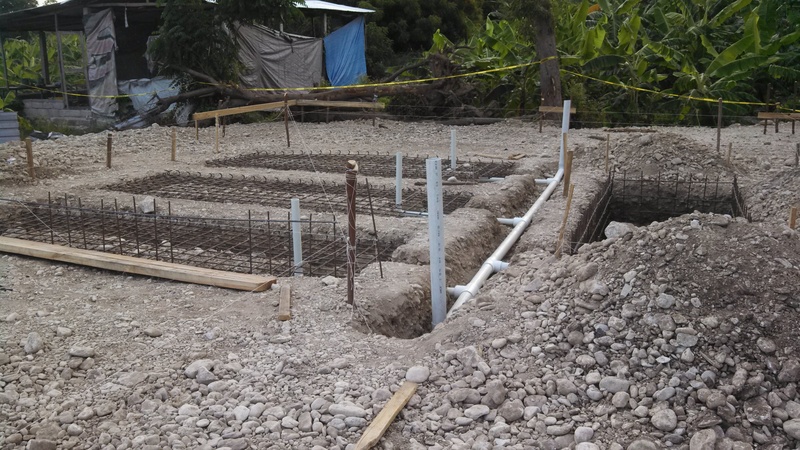 Progress continued today as we finished all the drainage plumbing and also completed the rebar assembly for the in-ground fish tank. We could not procure any PVC primer for the plumbing so we just used a liberal amount of PVC cement, hopefully it will hold forever. I asked the owner of the local hardware store why they do not have any primer and he told me that he has never used it and everything would be ok. So I am banking on that. This system is going to be a work of art when it is completed. The covering for the fish tank is quite large and will serve as a sitting area and heat refuge for students and system operators. The fish tank will appear more as a recreational pond but will be a functioning “raceway” type culture unit, eventually with sliding dividers to separate different age groups of fish. We plumbed the drain lines with intent for expansion so we have pipe clean outs on both ends of the growing beds and future drain lines for additional growing beds will be extended from the clean out ports. It is becoming apparent why growing various crops can be so difficult in Haiti. As the crew was digging the huge pit for the fish tank, you could see that no matter how deep you dig, there is an abundance of rocks. So many rocks that digging is extremely difficult and you have to use a pick axe just to break up the soil. The soil holds very little water, the climate is scorching hot, and irrigation water must be applied by hand to the entire field. I noticed that the only crops I have seen traveling all through Haiti are mostly bananas, plantains, okra, beans and castor beans. The bananas root very deep and do not require as much attention as a shallow rooted vegetable. The okra can tolerate very hot climates and the beans are mostly planted underneath the bananas the provide shade. I’m sure this contributed to the soil fertility because they are legumes, but they grow rather leggy looking for sunlight. If we can show that alternative forms of agriculture work here, it will be very beneficial in increasing the diversity of crops that can be grown. In industrialized nations it can be difficult to have a profitable aquaponics business because the marketing of different crops is challenging. 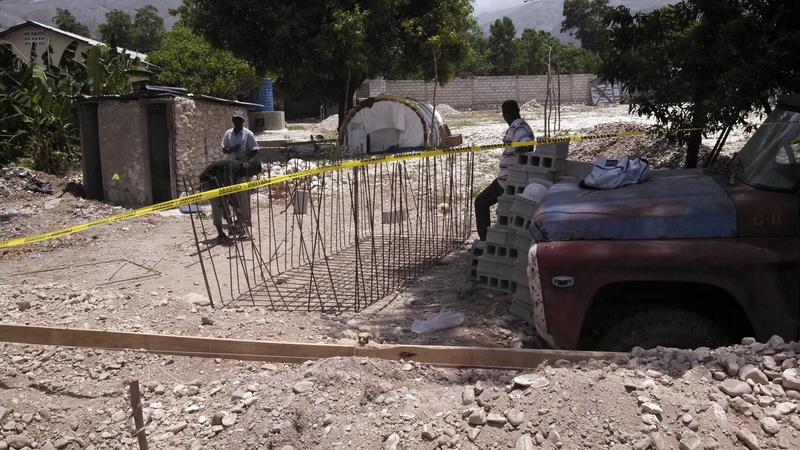 In Haiti there is very little high quality produce…period. If you have high quality vegetables and fish, and can find transportation to the right markets, you will not have any trouble selling out. The challenge is finding the capital to invest in the construction and ongoing operational costs. It is possible to run a system with no electricity if someone can manually pull buckets up from the fish tank by way of a pulley and fill the beds several times a day. 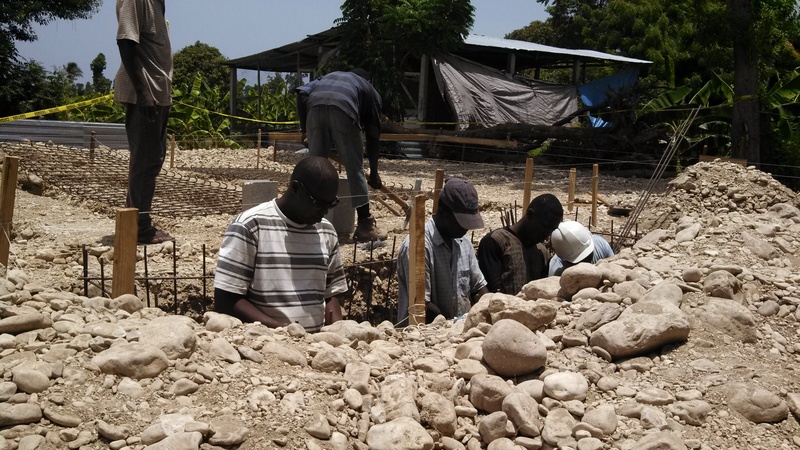 This may seem very labor intensive but farmers in Haiti already have much labor to do in their gardens such as back breaking cultivation of soil, weeding and watering. This system we are building is modeled after the IAVS system invented my Dr. mark McMurtry from North Carolina State University in the mid eighties. 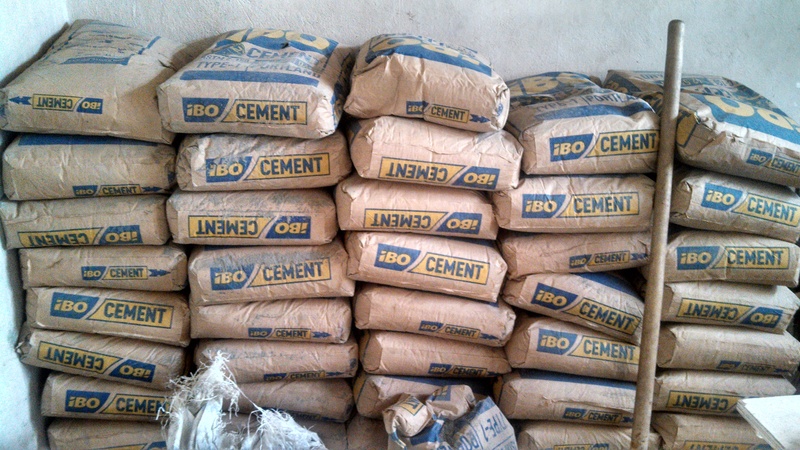 We so far do not have access to builders grade sand but we are trying to find a similar gravel type medium. I have spoken with Mark over the phone twice and he was very helpful in giving me suggestions on how such a system could be operated in Haiti, as he did extensive work all around the world, including rural areas of Africa. If you didn’t know Mark McMurtry was the inventor of what people now call the “flood and drain” aquaponics system. Crew starting to frame the growing beds with lumber to pour the concrete. Today was very hot…the sun was as intense as I have ever felt and I paid the price for trying to withstand it for too long. Several weak attacks made me concerned that I may be coming down with fever, possibly malaria. When the evening came and temperatures dropped I began to feel much better. Besides this the project is moving along nicely. 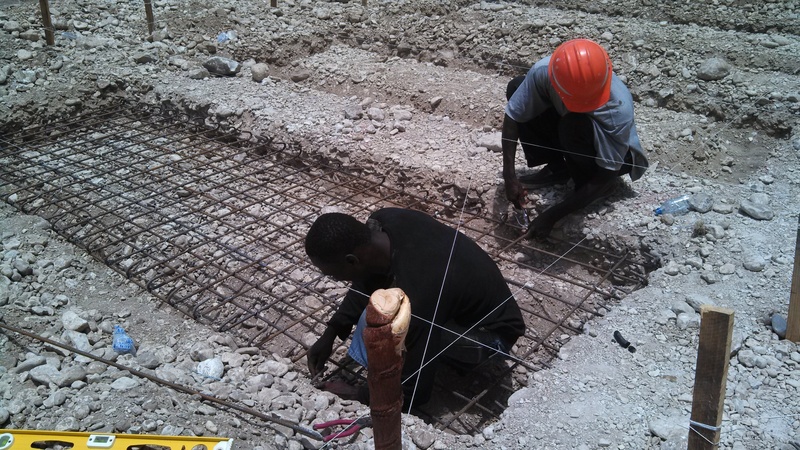 The construction team finished laying the rebar for the concrete foundations where the growing beds will be placed. I was impressed with the amount of detail the construction crew uses in every step of this project. 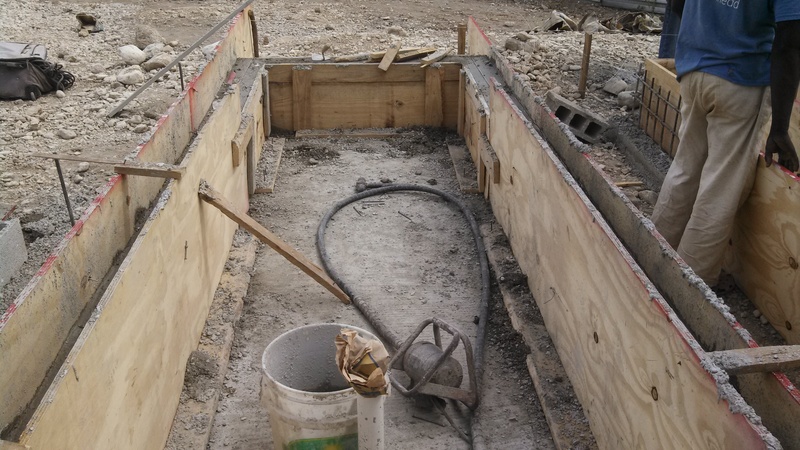 The holes are perfectly uniform and the rebar configuration is squared to perfection. This will by far by the strongest aquaponic system I have ever been a part of building. Tomorrow we will procure the PVC pipe and start to dig the trenches where the PVC pipe will be buried. 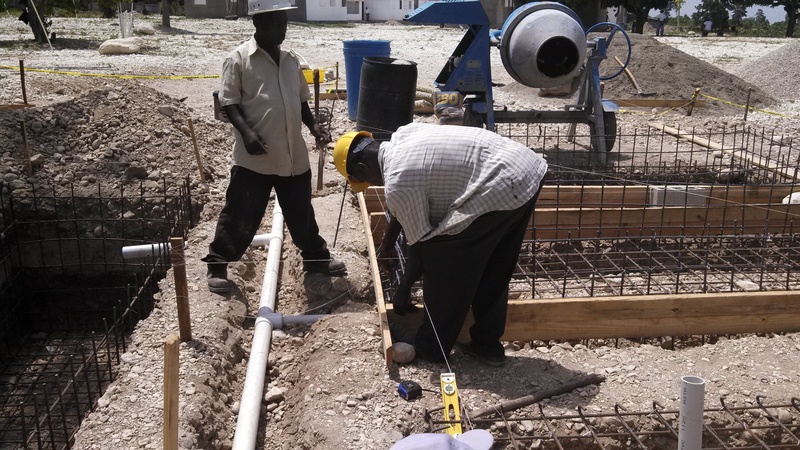 Once the pipe is in place the crew will begin to pour the concrete foundations. All re-bar frames are cut, bent,and assembled by hand. This frame is for the in-ground tank. Today was quite an experience. Actually that’s an understatement. Today was a truly unbelievable experience. We attended to church services one in Mahanaim and one in Port au Prince. 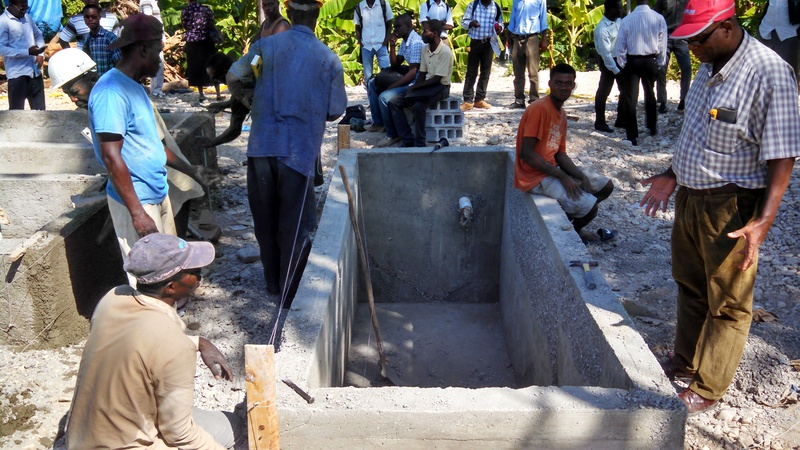 The first service in Mahanaim was very intimate with approximately 150 people, some of them were a part of the construction crew for the aquaponics project. We were invited to introduce ur selves to the congregation which was truly an honor. 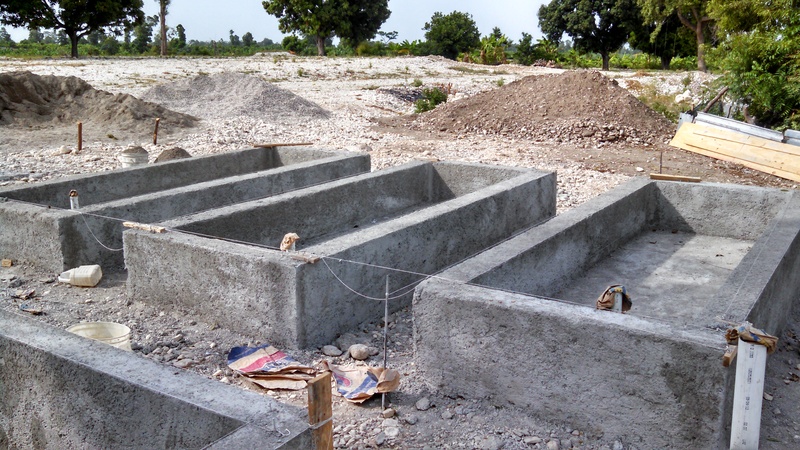 It also gave us an opportunity to thank those who have helped with the aquaponics construction. Everyone in Mahanaim is busy with everyday life and for them to lend their hands in the effort shows their commitment to the project and it gave me great pleasure to commend them for this. Below is a link to a clip of the high energy church service. Now the second service was totally unbelievable. The must have been 2500 Haitians at the service. The church service was held in an open air building which was slightly above the former church which was destroyed by the 2010 earthquake. The main building held maybe 1500 people and another 1000 people stood below looking upward at the service. The energy was intense and you could feel the emotion coming from the congregation through song and prayer. I am not a particularly religious person but even for me this was nothing short of breath taking. Luiguy asked us to greet the congregation and this was by far the largest audience I have ever spoken in front of. 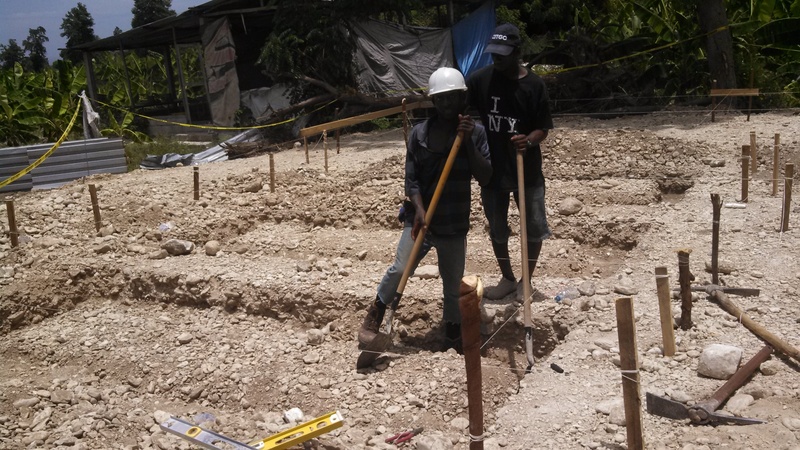 When I first met Ron Morgan in 2011 and he told me his vision for implementing food production in Haiti I knew it was something I wanted to be a part of and I had fantasies about what I thought it would be like. Those fantasies fail in comparison to what I experienced today. We haven’t even finished a full project in Haiti but getting invited to share an idea with thousands of people who have been through literal hell and back is something that I never envisioned doing and few people will ever do. It is something that will stay in my mind forever. Dr. O was also given a great opportunity today. He is a medical entomologist who specializes in researching the transmission of mosquito related diseases. A new virus called chicongonia is infecting people all over Haiti. This disease causes sever joint pain and fever and is fatal to those with compromised immune systems. Many Haitians believe this virus is caused by bad air or by god’s will. It is now proven that it is transmitted by mosquitoes just like malaria. It was amazing to see Dr. O educate thousands of Haitians about the truth behind chicongonia and I know it was an incredibly gratifying experience for him. It is now 10pm and rain is starting to smack down on the corrugated iron roof in our guest house. 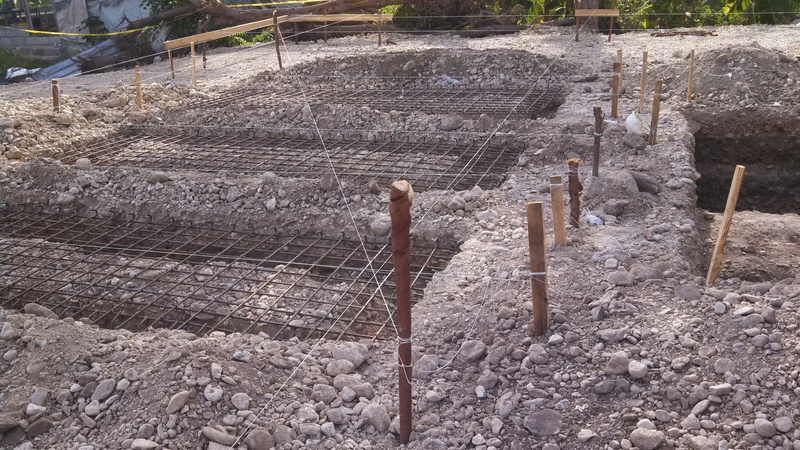 Tomorrow we continue with digging the fish pond and hopefully starting to construct the frames to pour the concrete. 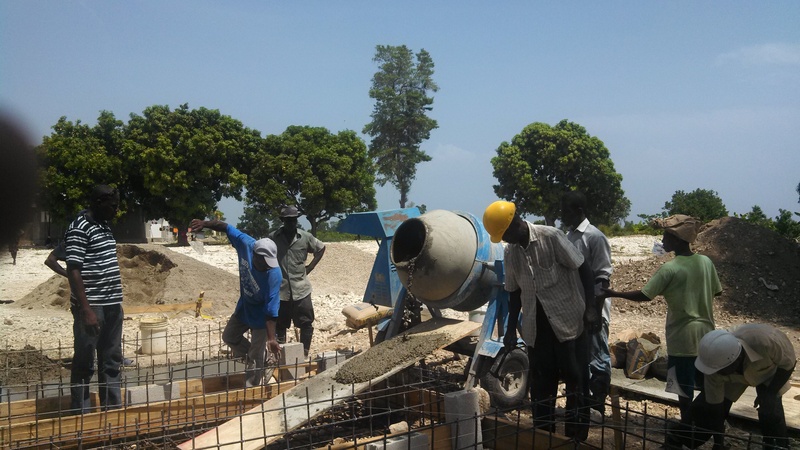 Language barriers can create obstacles, especially regarding construction…The construction team in Mahanaim got right to work following the site layout. As the plots for the bio filters began to get deeper and deeper, I started to become concerned. It seems that the engineer was not clear that the bio filters had to be completely above the fish tank and they had begun to dig them deep into the ground. When I saw this Luiguy quickly straightened things out and we got back on track. 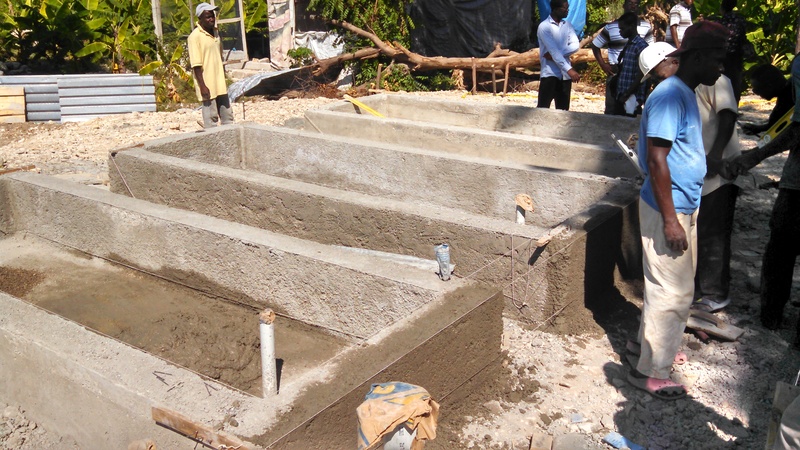 This coming Monday we may be able to start pouring concrete if we can fix the elevations for the three bio filters. Besides this small misstep things are going smoothly and the community is completely engaged and supportive of the project. Also I tested the gravel that was intended to be used for the growing media. Dr. O noted that it was most likely limestone so I tested it. I took a sample of about 300ml of bottled water and tested its pH, them i added about 10 small pieces of gravel to the same water, shook it up and retested the pH. The control sample had a pH of 6.4 and when I tested the sample with the gravel it gave a reading of 8.4. From this one test it seems that we will not be able to use this gravel as it will continuously dissolve and raise the pH of the water uncontrollably. I will perform the same test tomorrow wit another sample from the same pile of gravel just to make sure. 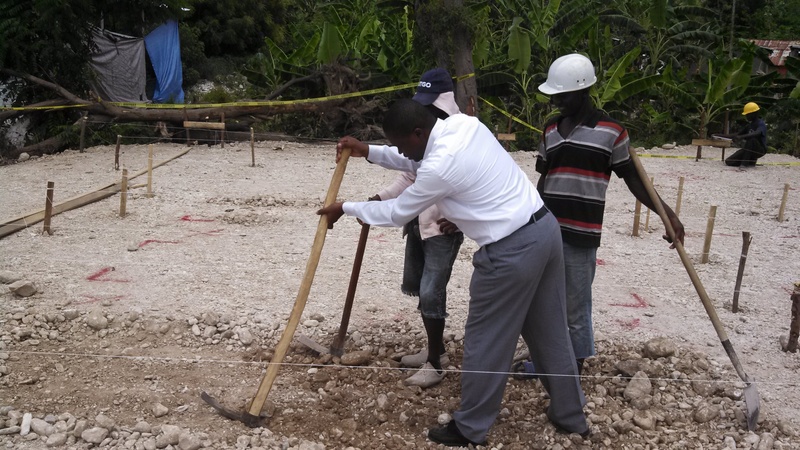 I was told by our lead engineer Franzy that we can source some quartz or granite gravel in Haiti, both of which are inert and can be used as the growing medium.